A rag doll is a cloth children’s toy. It represents a human figure, but in a distinctively homemade-looking way. 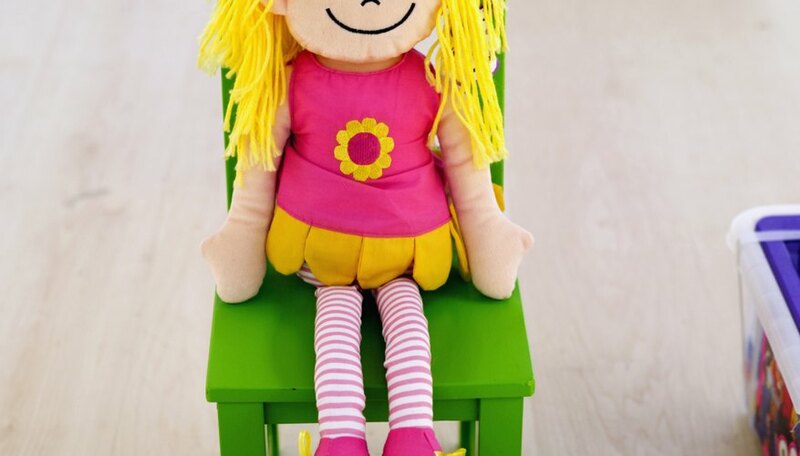 Because rag dolls are made from cloth, they are soft and suitable for small children. Rag dolls are made from different kinds of fabric such as plush, silk, cotton and other materials. Sometimes, rag dolls are known as church dolls because of softness and because the dolls don’t make a sound if dropped. Plan and draw your rag doll on a piece of paper. Draw all the body parts or one big body outline on the paper, in the exact size you want the rag doll to be. Use a pair of scissors to cut out the pieces. A one-piece rag doll will resemble a gingerbread man and a multi-piece doll will look more like Raggedy Ann. Both rag doll styles look equally old-fashioned and can later be adjusted with various additions and accessories. If you are going to make a Raggedy Ann-type doll, you have to draw separate pieces for the head, body, arms and legs. If you are not good a drawing, you can find free doll patterns online. Place the paper patterns on the fabric you want to use. This will be the basis of your rag doll. This fabric should be in a color resembling human skin. Use tailor chalk to outline the patterns on the back side of the fabric. Make two identical patterns from each of the shapes. The patterns will ultimately be two sides of a rag doll. Use tailor scissors to cut the patterns and shapes from the fabric. Cut about 1/4 of an inch outside of the chalked outlines, so you can have enough material for the hems. Sew the body parts of the rag doll or its entire body if it is one piece. Use a strong thread and needle. Remember, you need to sew while the fabric is on its back side. Leave one small opening on each of the rag doll’s body parts. At this point, turn the fabric so the front side is showing. Stuff the body parts of the church rag doll with the stuffing you selected. Use the small opening from the previous step. After stuffing, close the small opening by sewing it with a thread. Attach all the parts to one another using a needle and a thread. This time you can use a thicker needle and a stronger thread. Add hair, clothes and a face to your church rag doll. You can use different fabrics, buttons, accessories and decorations for this part of the project. You can even use colored fabric markers to draw your doll’s face. If you want, you can make legs, arms and face form a flesh-colored fabric and the torso from a colorful fabric. If you do this, you will not need to make clothes for the doll later. These rag dolls, when sewn by hand, get a special homemade look and feel. However, if it’s easier for you, use a sewing machine, especially if the doll is large. Always wear a protective cap for your finger when hand sewing. Based in West Windsor, N.J., Craig Barney has been writing computer- and electronics-related articles since 1990. His articles have appeared in “Wired” and “Ericsson” magazines, and on Discovery.com. Barney received the Kim Swiss Award in 2006. He holds a Master of Arts in journalism from the University of Missouri.